After a good 6+ weeks to test the UCAN product exclusively and extensively, I am more than happy to present a product review. First, a quick background on the product: It was developed as a slower burning carbohydrate for children with a genetic disorder that caused blood-sugar issues due to an inability to convert stored glycogen to glucose. I found UCAN when I was researching energy sources to help me with my late-marathon dizziness. Within the span of a week, an elite runner friend and the nutritionist I work with both told me about UCAN. As I looked into it more, I found many athletes and runners that swore by it. Not just some of the top runners, but a bunch of them!!! Crazy. How had I not heard of this before? As I looked into it more, UCAN really resonated with me. The starch they use (non-GMO corn starch, undergoing a 40 hour moisture processing treatment) is so slow burning and unique that your insulin receptors that are typically turned on when you ingest carbohydrates aren’t activated. Why is that important? Because then you can burn the UCAN carbohydrate along with your body’s fat stores!! With any other carbohydrate, your insulin kicks in which causes your fat burning abilities to “turn off”. Fat burning is something I have struggled with for years. I never seem to shed weight like other runners, and I carry a larger percentage of body fat than practically any other elite/sponsored marathoner out there. This is despite tracking everything I eat! I think my struggles have been from a combination of family history (many VERY overweight relatives – I don’t come from a family of runners! ), and also having taught myself to be a carb-burner over the years (I’ve always fueled before every run with carbs: oatmeal, fruit, bread, etc!). My U of MN study confirmed how much of a carb-burner I was. Anyone else found themselves in the same situation? Either it’s really hard to drop weight, despite high mileage, or finding out they’re a complete carb burner after a VO2 max study? Anyway, back to the point of this blog post! I started using UCAN 6 weeks ago (see my pre-UCAN blog post here), and I have found amazing results with it, especially when used consistently. I have been very diligent about taking one packet of the regular UCAN (1.19oz, 110 calories, 28g carbs) 30-45 minutes before every morning run. I try to have it mixed up the night before since I don’t function that well in the mornings, and also because I think it tastes better cold from the fridge. I usually do not eat anything else before my run, but if I do eat I make sure there are minimal carbs (greek yogurt, eggs, etc), since you don’t want to spike your insulin with other carbohydrates in order to continue to be in fat-burning mode. My favorite flavor is the Cran-Raz. After each morning run I take a packet of the UCAN with protein (1.98oz, 200 calories, 33g carbs, 13g whey protein). Sometimes I just mix the packet with water, sometimes I toss in a little fruit and make a smoothie. I am a big fan of the chocolate flavor (mmm… chocolate!). After this I am often not hungry again for 3+ hours! So – do the math: about 350 or so calories per workout. Previously, I needed 400+ for breakfast plus several gels during the workout, plus a substantial post-workout meal. You’ll hear this testimonial from everyone else using the product, and I assure you it’s true. 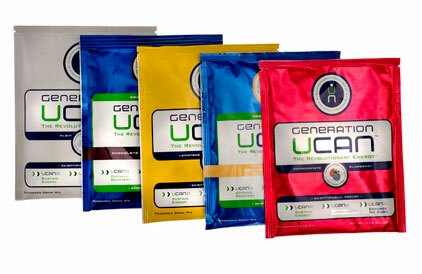 You’ll cut your workout-fueling-calorie needs in half, if not more, with UCAN. By sticking to this routine, the combination of burning more fat and needing fewer calories during workouts has lead my body composition to change ever-so-slightly each week. Nothing drastic (I have lost 3 pounds in 6 weeks), but see the photo evidence above as proof. I have always monitored my caloric intake and been diligent about tracking my weight. For the first time in my LIFE, I have found myself close to race-weight (the weight that I raced my previous two PRs – Grandma’s ’11 and Olympic Trials ’12) without being uber-hungry at night or depriving myself throughout the day. In addition, I haven’t had any energy “crashes” like I did when I was fueling with regular carbs or gels. I used to get dizzy 3/4 of the way into any hard or long workout, but that hasn’t been the case yet (and I have put in a number of 20-24 mile runs with tempo and marathon pace). I have yet to RACE a marathon with UCAN, but I’m very excited to see the difference in the last 10k of Chicago!!! If you’ve been at ALL considering using the product, or are just hearing about it and want to give it a try, please comment below. I am more than happy to help with any questions you might have (you can email me too at nichole(dot)porath(at)gmail(dot)com). If you at all relate to my weight/metabolism issues, or just want to stay fueled long into an endurance workout, please give this a try. It may change the way you fuel/eat in general – I know it has for me!!! *Disclaimer: I am a sponsored UCAN athlete and the product was given to me. Although, I will say that there is nothing in this review that I would change if I wasn’t sponsored. Truly! Previous Post: « Week in Review – 6 weeks out! The best place is online through their store – unless there is a retailer close to you? You could search to see. Online link: https://store.generationucan.com/. It's all about using it consistently (i.e. before/after each workouts for a good trial period). If you need to eat something additional before your run (other than the UCAN), make sure it's protein and fat, not a carbohydrate since that will spike blood sugar and cause insulin to be released… hence negating the effects of the UCAN carb. You can also use the protein product before a run if you need something more, since the carbohydrate is the same and you're just adding an extra 13 grams of protein. Please let me know if you try it and what you find! Seriously, I've been beyond impressed!! I will say I was impressed when I tried it on my 20 mile run last weekend. I will be interested to try it more and see how it does in a long ski race. Finally figured out how to log in…. I have had this issue forever….always carrying the pudge no matter my training regimen! Thanks so much! Once this lil guy comes out of my tummy, I'll have to try this out. Yes "youCAN" dominate at Chicago! Thank you for your review. Today I bought some sample pouches of the preworkout and protein recovery. I am eager to try it and have been reading up on UCAN to gain more knowledge about what's going into my body. I, too, have that tummy pudge that has been difficult to get rid of. I would like your opinion on one thing: I do CrossFit, do you think it will benefit me since CF is geared more towards lifting than long distance/time running? Hi! I am not sure how UCAN would work for something much shorter and explosive, so I actually forwarded your question off to UCAN for a researched/complete answer! Back to you soon!! UCAN is a healthy carbohydrate that will maintain steady energy and blood sugar levels, which is beneficial for any type of exercise. People who use UCAN prior to a crossfit workout find that they are able to push themselves for the entire duration of the workout instead of tailing off at the end. If you consume UCAN rather than a fast-acting carb like a bagel, banana, energy bar, or sugar-based drink before your workout, your body will be able to burn more fat for fuel during the workout because UCAN does by cause a rise in the fat-storage hormone insulin like most carbohydrates do. When insulin is low, the body can freely burn fat. The other benefit of using UCAN for shorter, intense workouts is that you won't have low blood sugar after your workout because the product still will stay with you. Low blood sugar after a workout often causes you to feel lethargic or makes you prone to ravenous hunger cravings. Finally, UCAN is very gentle on the stomach, making it ideal for high intensity workout like Crossfit where you don't want something sitting heavy in your stomach. Just tried it for the first time today. No kidding about the acquired taste. Also the texture is totally different. I'll try it again tomorrow because today was not a total success because I couldn't quite get it to blend and the taste seemed so weird. 3. The taste does grow on you! Have you tried either the chocolate or vanilla (they have protein in them)? I tried the chocolate flavor and only managed choking down 3/4 of it then had to gulp coffee and eat peanut butter to get rid of the taste. I want to use this and like it but both the chocolate and lemonade flavors made me feel nauseated. I think the orange flavor and chocolate are the best. Lemonade is by far my LEAST favorite!! I mix the orange very light before hand – one scoop with a half water bottle of ice water (have it cold!!). Then afterwards I mix one scoop of chocolate with water and ice and blend. I've come to crave this after each of my runs! If you're using the packets you may want to split a packet between bottles – perhaps it's to thick? Then it is hard to get down!! Hope this helps! It took me about 2 weeks to get used to the taste/texture but now I love it. It's worked great for me but it took a while – totally worth the results, though! Hi -I found this post when searching for review on UCan after a terrible marathon bonk (at mile 9! *cry*). Turns out I need more than 100 calories for breakfast. Go figure. Traditionally, I've been doing a a gel every 45 minutes (trail) or 5m (road). Are you still using gels during long runs, and if so, how many and how often? I'm going to try pushing back my first gel, (waited til mile 6 last week) but I'm wondering if I should keep my gel spacing the same or stretch it out after the first one. If you use UCAN before an event, try eating a normal breakfast (MORE than 100 calories!! ), then having 80-100 calories of UCAN 45 minutes before. Then I'd recommend a first gel at about 45 minutes in if you can't get UCAN out on the course… although there have been many that have made UCAN gels with success… I've just never tried it. I usually rely on the elite bottles where I'm spoiled and can put UCAN in them. If I can do that, I can get away with taking my first gel at an hour just to make sure I have enough in me. Hope this helps! If not, let me know! -What to eat or avoid in my diet between now and the race? -What if any solids would you or the UCAN team recommend on the race? I’ve found an entirely empty belly can be a challenge at times. I could write an entire blog post on these questions! Before the race, keep your diet the same. Definitely try UCAN on your runs before hand and during. You could try to carb load the 3 days before the marathon, if you don't already do that. Otherwise there's the 3/3 load and depletion. Solids before the race? I eat a normal breakfast about 2.5 hours before the race. 1:15 before I'll have another 50 calories or so of solids (1/2 banana), and then have 80 calories of UCAN 30-45 minutes before the race. During the race it's all about what you're used to and what your stomach can handle! I liked your review. I am (age grouper) Ironman Triathlete and have been using UCAN on & off for 2 years. It helps me drop weight before the season starts and also using during my races for protein & energy as I am not hungry at all during my races. I no longer have to do multiple gels. I am also a fan of chocolate protein one and just mix it with water. I buy the tub of it from a local bike shop but have also seen the tubs at Lifetime Fitness for $60 as it is more cost savings I believe. I use it after my workouts for breakfast and again for lunch and occasional as a snack in the afternoon. I workout very early in the mornings 3-530AM. For myself, as you age it's harder to shed the pounds, however, with UCAN I have no problem losing weight and decreasing my body fat %. On 2 different occasions I have lost 20-30lbs using it and keep the weight off during the season. This is awesome! Glad it's worked for you! I think it's the perfect product for those that either: 1) find themselves with energy problems during events despite multiple gels (the slow burning nature of UCAN helps tremendously with this), and 2) have had a hard time shedding weight before. I am an age grouper Ironman Triathlete also. I have watched several webinars sponsored by UCAN. There was quite a bit of discussion about becoming metabolically efficient and teaching your body to use fat stores for fuel. Is using UCAN pre, during, post work outs how you become metabolically efficient? How long does it take to teach your body to use fat for fuel? Do you need to change your everyday food consumption also? Just trying to figure out the whole picture! Thanks in advance for any guidance you can give me. Oh wow… so much to talk about here! You probably already know a lot, but I would be happy to share what I've learned and experimented with. A phone call might be best, otherwise I'd be typing all day. Send me an email: nichole (dot) porath (at) gmail! I'm curious if you use the UCAN recovery drink too? If so, how do you think it works compared to a traditional recovery drink with the fast-releasing carbs? I do. I think the best reason to just use the UCAN recovery drink afterwards vs. a traditional carb/protein shake is to remain in fat-burning mode for an hour or two after my run. That's honestly the only way I was able to lose the extra weight! If I had a regular meal right after my run my body would immediately shift to carb-burning mode. This way I can have a shake, get some carbs in me for fast recovery, but still be in fat burning mode. If you're not worried about losing anything, then I don't think it would matter what you're taking (just take a 3-5:1 carb/protein ratio as fast after a workout as possible). Thanks Nicole! The shedding of some extra weight would be a good thing. Good luck in your training and racing. Thanks Tom! You as well! I just ran across your blog post about UCAN. I am running Boston in 3 weeks and have always struggled with stomach issues, slowing my race time down significantly. 🙁 Have you used UCAN as your primary fuel for a marathon? I'm curious to try it, but realize I don't have a lot of time to experiment at this point. I'd love to hear if you've used it exclusively for a marathon. Take care. I'm so glad I found your blog! It is so inspiring! You can buy Generation UCAN Tropical Orange and the Vanilla Creme at your local Sprouts Farmers Market! I just picked up some of this to try out and review. So far I really like it and hope to see continued improvement. Great review! What have you seen after a ~6 weeks of using it? That's when I started to see big gains (and total cumulative fat loss). Let me know! This morning, I gave put this product to the test. I am an insulin dependent diabetic. My blood glucose level was at 145 when I got up, a little high, but not too bad. I drank the UCAN and ate nothing else, took my insulin to match the carbs in the drink, and checked my level 45 minutes later, right before my run. It was 220,very high for me. I did my 10 mile run in about 80 minutes. Within 30 minutes after finishing, when I was cooking breakfast, my blood sugar levels crashed to 41, the second lowest I have ever recorded. That is incredibly dangerous for a diabetic. I have been running for 4 1/2 years, including marathon training, and have only had my blood sugar crash like that one time before. I will be asking the company for a refund as their claims of slow release without the crash apparently don't apply to me. This discussion is very helpful. But, what I really need to understand is how to use Ucan in a marathon. I understand that you don't have to do this as you are an elite. But for others out there, how often do you take it and how much do you use? Thanks very much. I am 45 years old and got back into playing tennis at a competitive level around 6 months ago. I grew up playing tennis at a high level and have had the opportunity to train with college level players currently on teams. This has been very fortunate. I have noticed that as the training on the court and physical off the court has intensified unlike 30 yrs ago 🙂 those last 15 minutes grinding it out becomes very difficult. As we all know to really improve those last 15 minutes is where we make the gains. I read your blog and the discussion and I am interested in U-Can. Normally i get by with my everyday food diet but I need something that can prepare me not only in training but also those last games in matches. My question is do you think you U-can is for tennis and when would you recommend i take. Before a match etc. to have that last burst of energy i need to finish my training and conditioning. Also is this something I can take while playing, matches can last 2 hours and I see that players on the tour take drinks during matches, but i don’t know what it is? Thank you!! UCAN is for any activity, so yes, it could be used for tennis. Keep in mind that what makes UCAN different isn’t that it provides a “burst of energy” like you’re looking for, but sustained energy. I’d recommend taking about 100 calories of UCAN with protein before your match and then sipping on UCAN without protein during. You should feel a big difference between that and typical energy drinks. Then I’d take a gel or something really fast acting about 30 minutes from the end of your activity to give you a little boost (with caffeine) for that 15 minutes to go!